NOTE: Consumers please beware of counterfeits on eBay. Look for authentic Mix-Style Japan's laser sticker tag on the bottom of the packaging box. 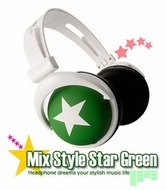 We only sells authentic Mix-Style products from Mix-Style Japan. A simple design by mix-style, Star-White headphones is in style and comfortable. The ear-pad covers the ear to block out unwanted noises for the large 40mm driver to produce crystal clear sound. mix-style's headphones are easy to adjust and carry. With the high quality gold-plating stereo mini-plug, it connects to any portable audio source such as iPods and laptops. Design with a casual outlook. Available only from Japan.